[See all the fraudulent/designed to deceive Government/industry studies shredded. This talk [vid 2014 May] The Legacy of Vaccine Injury by Dr. Andrew Wakefield is a good start. [July 2004] MMR and Acquired Autism (Autistic Enterocolitis) - A Briefing Note by David Thrower. 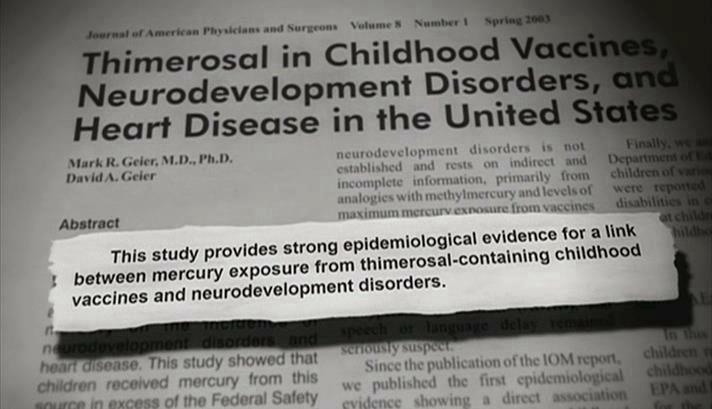 The Teresa Binstock & Sallie Bernard paper on similarity between autism and mercury poisoning is a true classic. http://dx.doi.org/10.1155/2015/545674 Assessment of Hair Aluminum, Lead, and Mercury in a Sample of Autistic Egyptian Children: Environmental Risk Factors of Heavy Metals in Autism. Farida El Baz Mohamed http://www.hindawi.com/journals/bn/2015/545674/ Results. The mean Levels of mercury, lead, and aluminum in hair of the autistic patients were significantly higher than controls. Mercury, lead, and aluminum levels were positively correlated with maternal fish consumptions, living nearby gasoline stations, and the usage of aluminum pans, respectively. Conclusion. Levels of mercury, lead, and aluminum in the hair of autistic children are higher than controls. Environmental exposure to these toxic heavy metals, at key times in development, may play a causal role in autism. Detection of Measles Virus Genomic RNA in Cerebrospinal Fluid of Children with Regressive Autism: a Report of Three Cases J.J. Bradstreet, M.D. ; J. El Dahr, M.D. ; A. Anthony, M.B., Ph.D.; J.J. Kartzinel, M.D. ; A.J. Wakefield, M.B.